They say there are only two sure things in life: Death and Taxes, but I disagree. In our house there are at least two more sure things: Love and Laundry. If you have children in your household, you know the struggle that is laundry day. It seems as though once you get through one load of laundry, the next is already sitting there waiting to be washed. In our house, the clean clothes don’t make it out of the laundry basket, let alone put away properly. And so as my own personal “ode to never ending laundry” I created this fun watercolor printable, a perfect decoration for your laundry room. I’m giving it away as my gift to you, a fellow laundry maven. There is one other thing I know for sure. No matter how many loads of laundry pile up or how busy I get, I CANNOT leave liquid laundry packets out on the counter or on top of my washing machine where the children can reach. It’s easy to not close the container or put liquid laundry packets back in the cabinet since, “I’ll will be coming right back to do the next load” but it only takes a second for kids to get into them and cause an accident. It’s important to keep all cleaning products, especially liquid laundry packets, in their original containers with product labels intact so they’re never mistaken for something else. 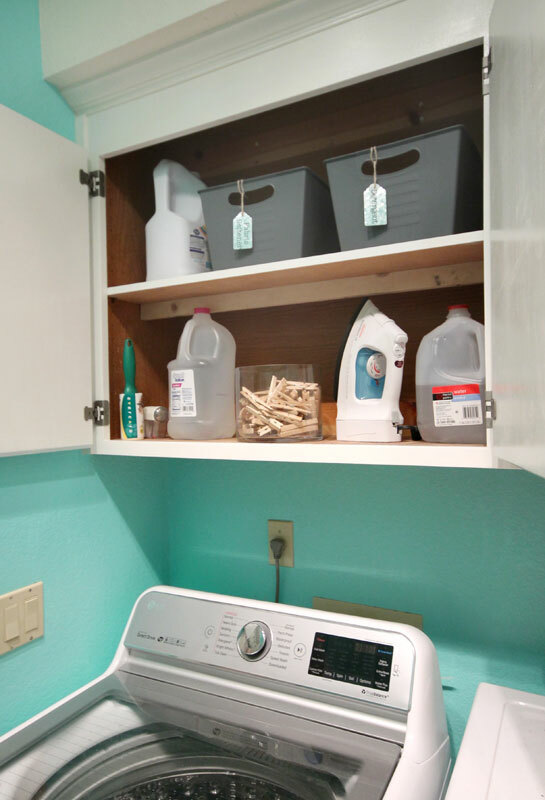 I store my detergent, fabric softener and laundry packet containers inside secondary detergent containers, that are opaque so the kids can’t see or be tempted by what is inside. I keep them up on the top shelf of my cabinet to keep them out of sight and reach, even when the cabinet doors are open. This is just one way I’m reducing the risk of accidents in my laundry room. Check out this video from the American Cleaning Institute showing the view from a child’s eyes. It reminds us how important safe storage is to keeping kids safe at home. 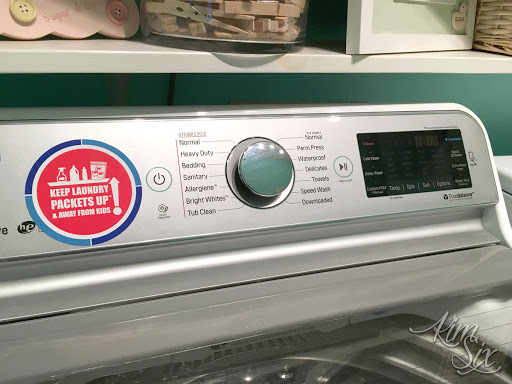 As a personal reminder, I have recently added a free cling sticker on my washing machine as a visual cue to always return my liquid laundry packets, bleach and stain treaters to my high cabinet above the washer and dryer. I encourage you to order the American Cleaning Institute’s free PACKETS UP! cling decal that you see here for your laundry room as a reminder to keep laundry packets up high and out of reach. Request one for yourself and all your loved ones! And don’t forget to enter your email address below to receive your free Love and Laundry printable. I have one version in seasonal fall colors along with the plain black and white text version (that way you can use your own paper color or background design.). This is such a cute printable. It is so true we will always have love and laundry. It is so important to child proof your laundry room. It only takes a second for a kid to get into something they shouldn't. This printable is so cute! There is seriously nothing more true than that when it comes to family. This printable is so cute! If there are two things we always have in our home, it is also love and laundry! I really love your prinatble poster you created. Very stylish and perfect for the laundry room.